The World Rubik's Cube Championship 2009 is the 5th World Championship and will take place on October 9/10/11, 2009 in Düsseldorf, Germany. Düsseldorf is the capital city of the German state of North Rhine-Westphalia. It is an economic centre of Germany. The city is situated on the River Rhine, and is renowned for its many events and also for its fashion and trade fairs. 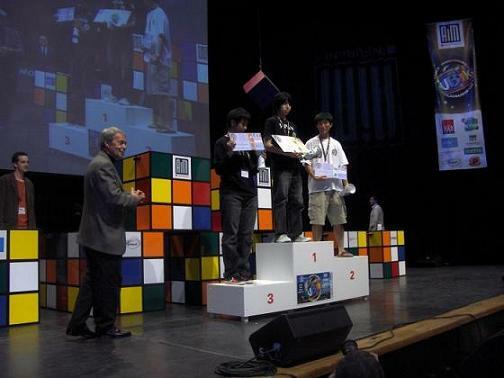 World Rubik's Cube Championship 2009 is an official competition of the World Cube Association. Saturday (08:30 - 20:00): official opening, preliminary rounds for main events, finals for some side events, party. Sunday: (09:00 - 17:15): finals, winner's ceremony. The World Rubik's Cube Championship 2009 is open to competitors from all countries of all ages. Competing at the World Championship is free. All competitors receive a gift pack. If you have any questions, feel free to contact the WC 2009 organisation team. October 12, 2009 Breandan Vallance won the World Rubik's Cube Championship 2009 with an average of 10.74 seconds. Erik Akkersdijk finished second (11.52) and Tomasz Zolnowski finished third (11.64). World records: Dan Cohen 4x4 36.46 (single), Yumu Tabuchi Rubik's Cube One-handed 16.90 (average), Michal Halczuk 7x7 3:43.15 (single), Piotr Michal Padlewski Square-1 10.96 (single), Bálint Bodor Megaminx 57.94 (single). Asian records: Yumu Tabuchi Rubik's Cube Fewest moves 29 (single), 4x4 blindfolded 8:41.85 (single), Ryosuke Mondo 5x5 blindfolded 26:30.00 (single). European records: Erik Akkersdijk 4x4 39.43 (single), Michal Halczuk 7x7 4:01.23 (average), Piotr Michal Padlewski Square-1 15.21 (average), Rafal Guzewicz 5x5 blindfolded 15:43.00 (single). North American records: Dan Cohen 4x4 46.94 (average), Megaminx 1:20.34 (single) 1:27.30 (average), Timothy Sun Rubik's Cube with feet 58.38 (single). South American records: Pedro Santos Guimarães 4x4 53.30 (single) 1:07.85 (average), Rubik's Cube One-handed 18.27 (single), Megaminx 1:35.77 (average), 4x4 blindfolded 13:09.00 (single), Renan Mondini Cerpe 2x2 3.33 (single). October 12, 2009 Medal ranking per country. October 12, 2009 Results of the Mosaic Building event. October 6, 2009 We sent a newsletter to all registered competitors. September 28, 2009 V-CUBE provided some extra prizes: 1,500 euros + 3 sets of V-Cubes. September 28, 2009 Joker AG provided some extra prizes: 5 Touch Cubes for Rubik's Cube World Champion, #1/#2 in Touch Cube event, 2 lucky draws among the Touch Cube solvers. September 11, 2009 Updated provisional time schedule. September 11, 2009 Qualification period (September 9, 2009) has closed. We handled all personal qualification times and waiting lists. Check out the Competitors page to see for which events you will be able to compete. August 16, 2009 On Saturday we will have a Mosaic design and build competition. See Events page for more details. August 15, 2009 Qualification times have been set for qualification rounds of: 4x4 Cube, 5x5 Cube, Rubik's Cube One-handed. August 15, 2009 Additional competitors have been accepted for some events. See the Competitors page and Events page. August 15, 2009 At the end of the qualification period (ending September 9, 2009) we will select some additional competitors (based on previous results and/or randomly) from the waiting lists to be able to compete in events that they did not qualify for. August 14, 2009 In the main hall, next to the main stage, Joker AG will present the Touch Cube. There will be a prize for the fastest Touch Cube solver of the weekend (1 try per person). July 31, 2009 Registration has closed, except for special cases. June 30, 2009 Registration has closed because more than 350 competitors have registered. Registration is still possible but competitors will be placed on a waiting list. June 30, 2009 Update of the provisional time schedule. June 30, 2009 All competitors for Rubik's Cube event have been accepted for first round on Saturday. June 10, 2009 Registration for World Rubik's Cube Championship 2009 has opened.